So the Marine Corps Marathon, my 11th race over 26.2 miles, is done, dusted and will go into the books as definitely one of my better and more enjoyable marathon experiences. For the record, my time was 3:42:21 and was my best time in 2 years, and my 4th best time to date. It was significant improvement over the dismal 4:15 I ran in Seattle in June, although perhaps my time in DC was more a reflection of how bad that Seattle run was, as much as how good the DC time ended up being. Training doesn’t lie. The training is actually something I’m really proud of. 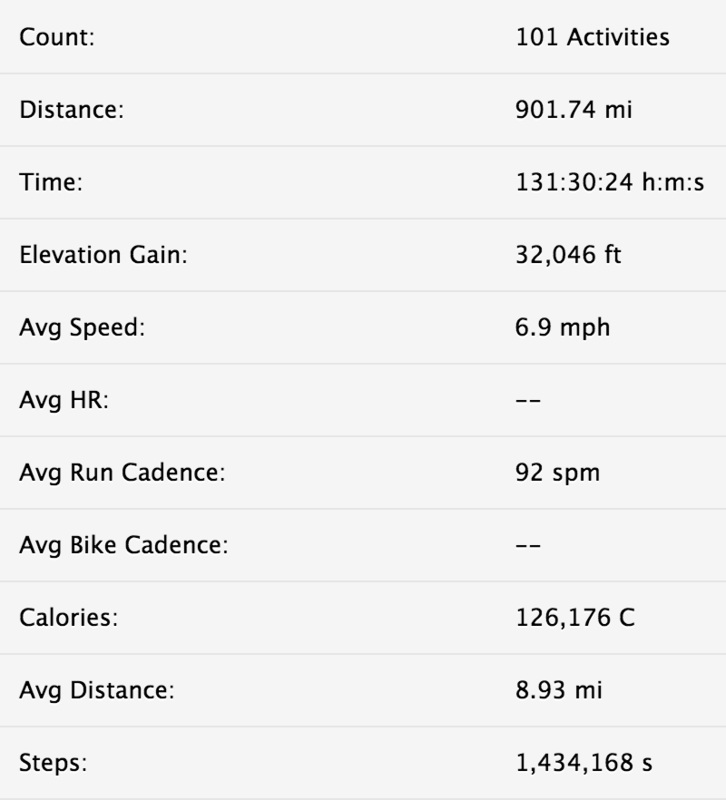 101 runs and over 900 miles covered including the race itself. Over 130 hours of effort, focus and discipline over 18 weeks. I learned to properly incorporate speed and strength runs, tempo runs, and learned the importance of easy runs in building aerobic fitness. I went into the race with some confidence that I could run a good race, because I knew I’d put the effort in. Day 1 to the race itself. The numbers behind the run. I had a good race strategy. I studied the course, knew by and large what to expect and when to expect it, and figured out where I wanted to attack, and where I wanted to hold. I didn’t panic when I got stuck behind slower runners at the start and was able to run negative splits – my fastest mile was actually a 7:59 at mile 24. Like I said, I probably finished with a little left in the tank, which was fine. I fueled properly, and to plan. Having studied more about a body’s nutritional requirements during endurance activity, I was way, way smarter about it than I’ve ever been. My pre-race fueling was spot on, and during the race itself I took my fuel when and where I wanted to. Hard to believe I’ve completed races with little to know in-race nutrition in the past, and totally helps explain some of my poorer efforts of the past. The extra-curricular and peripheral activities were well managed. We got into DC 3 days ahead of the race, which definitely helped from a body clock standpoint, and I was careful to rest up the day before, rather than spending the day on my feet sightseeing (and God knows I’ve made that mistake before). No thanks to the race organizers (see below) I got to the start in good time and was able to do the bag drop, porta-potty and warmup thing without any stress. Any one of these things is small on its own, but added up, they can contribute to making the race itself a less than happy experience if you’re not careful. Put it another way, what a shame to undermine 18 weeks of training by not paying attention to some of these details on race weekend itself. So what about the Marine Corps Marathon itself? Did it live up to it’s billing as ‘The People’s Marathon’ and one of the US’s biggest races? First off, DC was a brilliant place to visit and for me this is a ‘must-do’ marathon if you are in to the idea of destination marathons. I’d never been to the nation’s capital before and I was not disappointed. So much history, great art, fantastic monuments and museums – I’ll definitely go back and spend more time there, no doubt, and for that reason alone I highly recommend the MCM. Secondly, the course was, by and large, a great course. Apart from the first two miles and a few rollers later on, the course was reasonably flat and fun to run. The course was generally scenic, and took us through some parks and past some of the great monuments (although I’d be lying to say I paid much attention to them while I was running!). There are quite a few twists and turns in the course, and I got some solid advice from my fellow blogger ishouldrun who advised me to take care to run the tangents, so consider those wise words shared. The crowds were fantastic and super encouraging, and the ‘Blue Mile’ where there were pictures of fallen Marines lining the route was incredibly moving, and brought tears to my eyes. 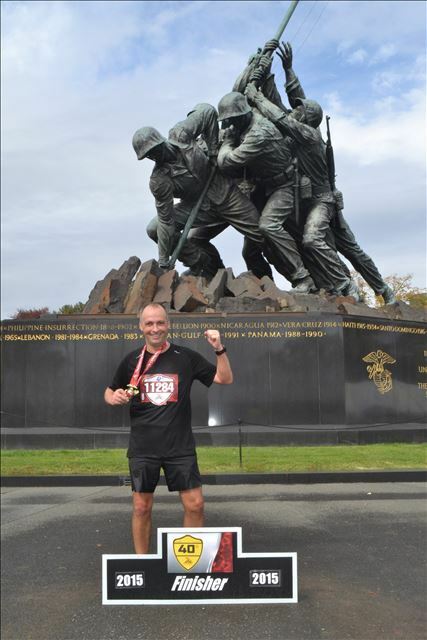 Being able to finish in the shadow of the Iwo Jima statue and have my (awesome) medal presented to me by a Marine were also absolute highlights. So lots of positives. That said, there were a few well documented missteps in organization that the race directors and sponsors really do need to iron out going forward, a couple of which were really surprising given this was the race’s 40th anniversary. Expo lines. Personally I’m always grateful for the sponsors who put their money into the staging of these events, especially a great Seattle HQ’d company like Brooks. No doubt it was unfortunate that the credit card machines went down (at least I think that is what happened) but it didn’t look like there was much of a Plan B in place, and the lines to buy race branded merchandise were horrendous. I figure it must have cost Brooks six figures in lost retail sales, not to mention some brand frustration. Security lines on race morning. Especially after what happened in Boston, the MCM is always going to be a high profile event requiring some thought around security, and as a participant I’m grateful for every measure put in place to keep me, my fellow runners, the spectators, volunteers and emergency services safe. That said, the level of traffic flowing into the runners village was entirely predictable in terms of volume (they knew how many people planned to run the race) and timing (they knew when they planned to start the event), so the entirely inadequate number of security check points and metal detectors (which were eventually turned off anyway) was completely inexcusable in my book. Why were spectators allowed into the Runners Village at the start? This was just crazy, and added to the general confusion and mounting frustration at the start. There were people with strollers and rucksacks etc, etc, all trying to jam through the same number of checkpoints as the runners themselves, and if you think I’m over-reacting, think about this next time you are running late for a flight, and you get to the security line only to find that everybody who came to drop off departing passengers were also going through security to wave them off at the gate. I know of a number of people ended up starting 15-20 mins late despite arriving the requested 2 hours ahead of the scheduled start – not good enough. Lack of structured corral management. Some races do this very well, and with good reason – it makes total sense for the fastest runners to start first, with progressively slower runners starting behind them, so that people do not have to expend precious energy dodging and weaving through traffic so that they can run at their own pace. This didn’t happen in DC – it was entirely voluntary, which resulted in a ton of slower runners starting ahead, jamming up the course for people who wanted to run faster. Again, it might seem like a small thing, but if you’ve trained hard, and are seeking a personal record or BQ, losing precious minutes at the start to an entirely avoidable issue is a big deal. Finishers and family meet-up area. This wasn’t an issue for me, but I read a number of complaints about how narrow the area was where runners exited the course and met up with their family and friends. Looking at the geography of the area, it wasn’t clear to me exactly how else this could have been done, and to my it seems a small price to pay for the honor of finishing by the Marine Corps Memorial. Happy to see these guys at the end. Never underestimate the value of your support team! The good news is that any one of these gripes are easily solved by better planning and forethought, and ultimately none of them ruined my experience at all. Doesn’t mean it could not have been organized better, and I’m sharing these things with you now more as a heads up to anyone planning to run the MCM next year. 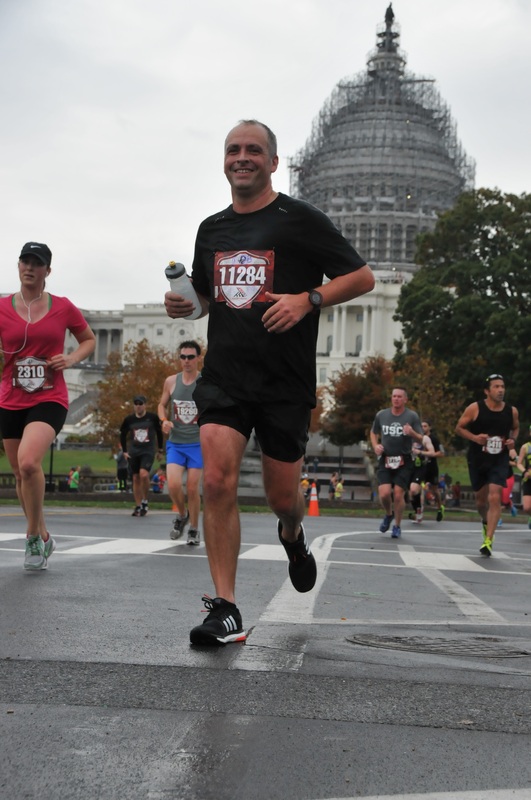 Whatever the problems mentioned above, I unreservedly recommend running it, both for the experience of the race itself, and the great time you can have staying in DC. What about you? If you ran the race, what did you think of it? Did it live up to your expectations and would you do it again? That’s all for now folks. I’ve had a week off and am now just enjoying getting out on a few easy runs and thinking about what I’m going to do next. In the meantime, lets all keep moving. Previous Post Previous post: OORAH! Your finish time was great! Congrats! Glad you followed the tangents. 🙂 I was having trouble taking my own advice because I couldn’t tell if we were about to turn right or left at times. As for your cons, I got to the area before all that stuff went down with security, but I definitely thought the other stuff was a little messy for sure. But it’s like you said, these should be minor issues to correct next time. It was so strange to me though because I thought last year they did it all so well! Then this year things were more difficult. I don’t get it. Change in race management? Still a great race though! 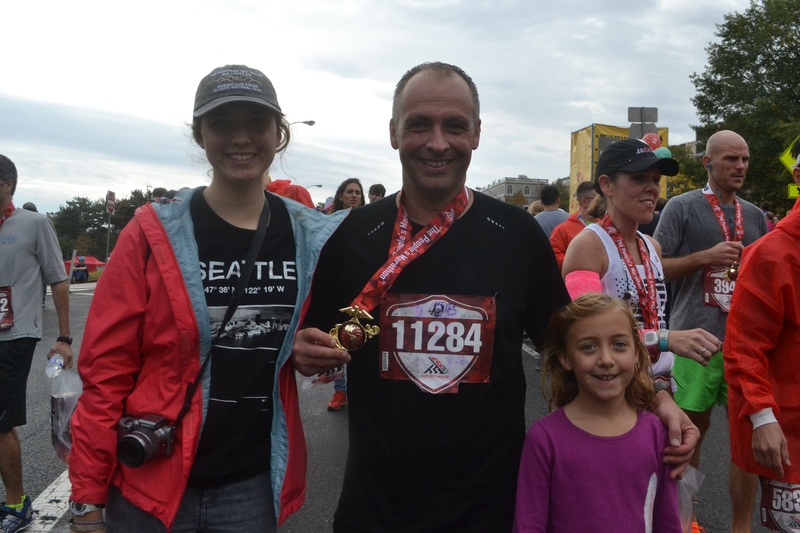 Yes – still a great race and I’d encourage anyone to do it. Are you going to do your Disney race?